Despite earlier reports, Akira's live-action remake isn't completely down for the count, provided that the script can be re-jiggered. 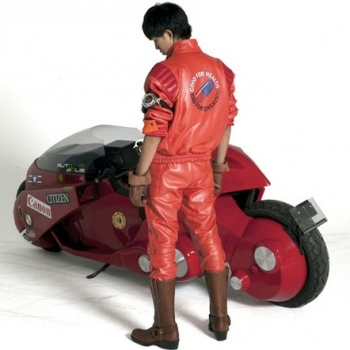 Even though insiders are claiming that production on the live-action adaptation of Akira has been shut down, Warner Bros. doesn't seem quite willing to give up on the oft-maligned remake. Despite earlier rumors that the film company was considering saving the project if it could slash the budget even further, it now sounds like this isn't entirely true. Instead, insiders are now claiming that the script needs to be re-tooled, and the man who wrote The Dark Knight might be the person to do it. Variety is reporting that executives feel that Akira's screenplay needs more "fixes" before production can start up again. The two men who are being considered for this project are Jonathan Nolan and Michael Green. Nolan probably sounds familiar to you, since he wrote the screenplays for The Dark Knight and The Prestige. Green, on the other hand, is best-known for his writing work on the Green Lantern cinematic hate crime movie and episodes of Heroes. Admittedly, Nolan has some pretty solid work in his portfolio, but even if Warner Bros. can get him to work on Akira, it may be way too late to save this particular turkey. The movie has had too many problems, too many delays, too many compromises to meet executives' demands, and generally sounds like something that won't be even remotely faithful to the source material. The best thing Warner Bros. could do at this point is just to let the movie die quietly and start over from scratch in a few years' time.